EVERYONE needs a little HEAD! 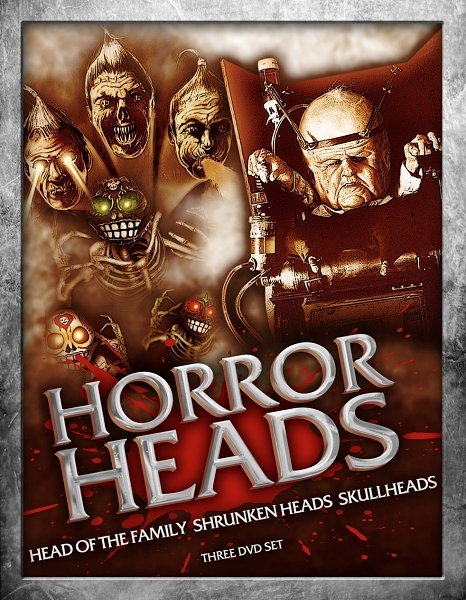 This new collection includes HEAD OF THE FAMILY, SHRUNKEN HEADS, and SKULL HEADS. All three DVDs come together in a special, space-saving slimline DVD case. Howard is the meanest nastiest thug in town, a Harley riding criminal with a hot wife Loretta (Jacqueline Lovell). Loretta's problem is she's having an affair with Lance owner of the town diner and Howard s getting suspicious. Driving back from one of their nightly flings, Lance witnesses the local family of weirdos, the Stackpools, dragging a man from his truck and into their house. Seeing this as an opportunity, Lance discovers the Stackpools terrible secret. They are quintaplets but instead of being born as a normal human, they each have one of the traits of one human being: One is extremely strong; one has extremely well-developed senses; one is extremely attractive ; and, one is extremely intelligent. The whole family is run by the one who has super intelligence, meet....MYRON the 'Head of the family'. When you NEED a little HEAD...Inspired by their favorite comic book heroes, young Tommy and his pals take it upon themselves to clean up their menacing neighborhood by busting the local street punks. But the three youths run into big trouble for all their good intentions in the form of Big Mo (Meg Foster), the local crime boss and all around bully. Mo wastes no time in wasting the trio of irritating do-gooders. But Sumatra (Julius Harris), a retired (but still practicing) voodoo specialist revives the boys with a healthy dose of mumbo-jumbo. Empowered beyond their wildest dreams, the shrunken trio head out to take on Big Mo and her boys. Some family secrets should stay buried...The mysterious Arkoff family lives in a castle secluded from the outside world, but their beautiful daughter Naomi (Robin Sydney) desperately wants to connect with the outside world. When Naomi invites three outsiders into the castle, they turn out to be deadly art thieves. The thieves are soon given a taste of there own medicine by the castles protectors. These protectors are empowered by ancient Italian witchcraft and elemental magic. Some know them as SKULL HEADS!